It is with much pride that I present Navajo jewelers Darryl and Rebecca Begay as our featured artists for September, quite a fitting placement on the heels of their success at the recent Santa Fe Indian Market where they took home the coveted "Best of Show" award. A testament to the high caliber of artwork that Darryl Dean and Rebecca produce, their award winning piece was a belt entitled "Return From the Long Walk." For the belt, they created fifteen separate images in tufa cast silver representing the continuing success of the Navajo people despite their harsh removal and internment by the United States Government at Fort Sumner (also called Bosque Redondo) between 1864 and 1868. Through Darryl and Rebecca's belt, we're reminded of significant Navajo historical figures like a World War II Codetalker, a weaver, a basketmaker, and even a major league baseball player. Darryl Dean and Rebecca Begay are probably best known for their use of tufa casting, a very old and difficult Navajo technique in which images are carved into a soft sandstone called tufa forming a mold into which molten metal is poured and hardened. Darryl and Rebecca carve quite intricate images into the tufa, and a single image can take a day to carve into the stone. For this reason, Darryl Begay sees himself not only as a Native American jeweler but also as a sculptor. . . of miniatures - his tufa cast jewelry is, indeed, filled with complex relief depictions of humans, animals, plants, and other symbols, with truly a sculptural quality. The Begays are also known for working in rich 18kt gold as well as silver and for using only the highest grade natural turquoise - Lone Mountain is one of their favorites! Following in the fine jewelry making footsteps of Darryl and Rebecca Begay are their two youngest sons, Nathan and Robert. We're lucky enough to have acquired a wonderful tufa cast belt buckle by middle son Nathan Begay who just turned 9, as well as jewelry and paintings from Robert Begay, the youngest, a multi-talented Native artist, who just won a first prize at Indian Market for a silver seed pot and a third prize for a painting. View work by Darryl & Rebecca Begay Family Here. 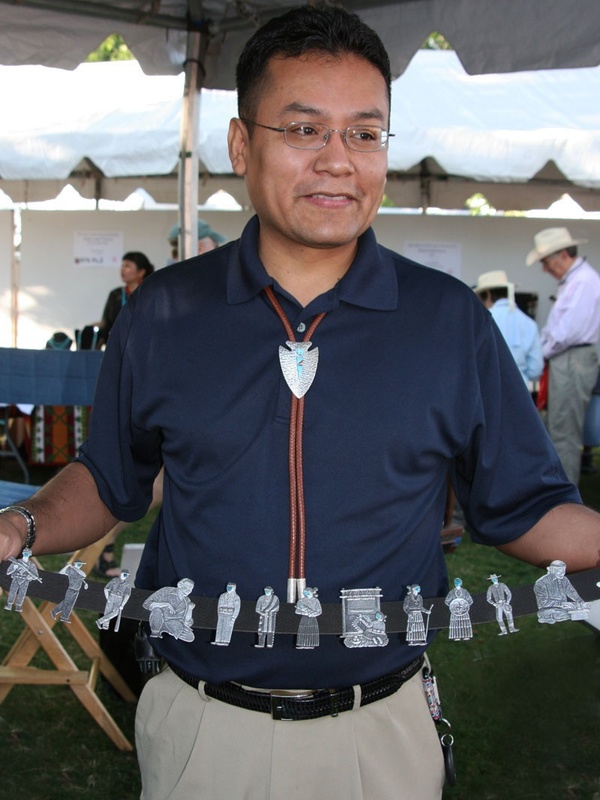 Click here for a video of Darryl Begay discussing his jewelry.